NASA's Aqua satellite provided an infrared look at powerful Hurricane Florence early on Sept. 11 that indicated it was likely undergoing eyewall replacement. Intense hurricanes can and often undergo an eyewall replacement cycle. That happens when a new eyewall or ring of thunderstorms within the outer rain bands forms further out from the storm's center, outside of the original eye wall. That ring of thunderstorms then begins to choke off the original eye wall, starving it of moisture and momentum. Eventually, if the cycle is completed, the original eye wall of thunderstorms dissipates and the new outer eye wall of thunderstorms contracts and replace the old eye wall. The storm's intensity can fluctuate over this period, initially weakening as the inner eye wall dies before again strengthening as the outer eye wall contracts. NOAA's National Hurricane Center (NHC) said that recent satellite imagery shows that the eye of Florence has become cloud filled. A microwave image of the storm at 12:41 a.m. EDT (0441 UTC) showed a double eyewall structure. These observations suggest that an eyewall replacement cycle is likely underway. 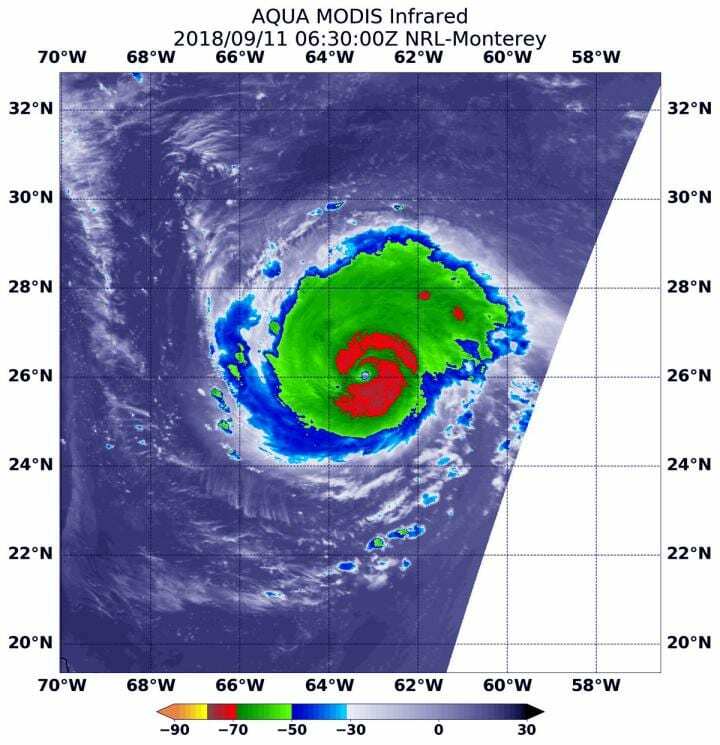 At 2:30 a.m. EDT (0630 UTC) on Sept. 11, Moderate Resolution Imaging Spectroradiometer or MODIS instrument aboard NASA's Aqua satellite analyzed Hurricane Florence in infrared light. MODIS found coldest cloud top temperatures around the eye, as cold as or colder than minus 80 degrees Fahrenheit (F)/minus 112 degrees Celsius (C). Surrounding the eye were thick rings of powerful storms with cloud tops as cold as or colder than minus 70F (minus 56.6C). Infrared data also shows that the sea surface temperatures ahead of Florence are at least 84.2 degrees Fahrenheit (29 degrees Celsius). That's important because tropical cyclones need sea surface temperatures of at least 80F (26.6C) to maintain intensity. Warmer sea surface temperatures provide more energy for the tropical cyclone. At 8 a.m. EDT (1200 UTC), the center of Hurricane Florence was located near latitude 26.4 degrees north and longitude 64.6 degrees west. That's about 405 miles (655 km) south of Bermuda and 950 miles (1,530 km) east-southeast of Cape Fear, North Carolina. NHC said "reports from an Air Force Reserve Unit hurricane hunter aircraft indicate that maximum sustained winds have decreased to near 130 mph (215 km/h) with higher gusts. However, Florence is still a category 4 hurricane on the Saffir-Simpson Hurricane Wind Scale. Re-strengthening is forecast to occur during the next day or so, and Florence is expected to be an extremely dangerous major hurricane through Thursday night. Hurricane-force winds extend outward up to 40 miles (65 km) from the center and tropical-storm-force winds extend outward up to 150 miles (240 km).